Like wines, cigars develop and mature in flavor and aroma when placed in the ideal environment. The EuroCave Humidor guarantees your fine cigars will develop fully, and will maintain the ideal environment for as many as 1,000 cigars. Like wines, cigars develop and mature in flavor and aroma when placed in the ideal environment. 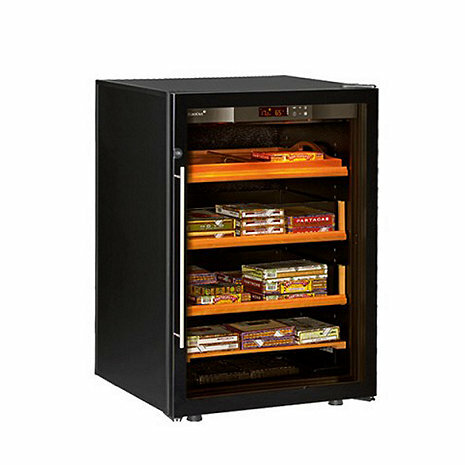 The EuroCave Humidor guarantees your fine cigars will develop fully, and will maintain the ideal environment for as many as 1,000 cigars. Automatic temperature and humidity control. Digital LED display and solid-state electronics for impeccable, maintenance-free operations. I own two EuroCave Wine Cellars so once I decided I need to upgrade my Humidor for a second time, I was pleased to find they made a small Humidor that hold about 1,000 cigars. You will never need to look elsewhere again, its like having a store in your house, you can have a variety of cigars to choose from.